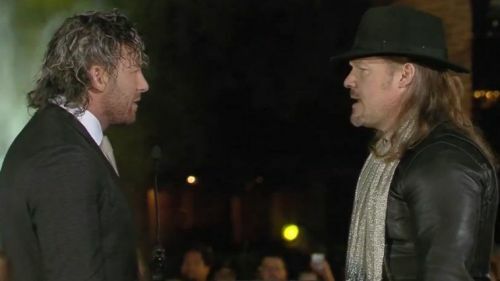 Will Kenny Omega or Chris Jericho be the first AEW World Champion? AEW officiallly teased that an AEW World Heavyweight Championship is in the works. Could it be revealed at the upcoming AEW Double Or Nothing PPV in May? There's a lot of excitement around AEW. All Elite Wrestling was announced in January 2019. They made headlines by signing Chris Jericho, a living WWE legend to the AEW Roster. What soon followed was also the signing of Kenny Omega. The AEW Roster is not something to scoff at. They have been signing a lot of talent across the board including The Lucha Bros who have a match scheduled for AEW Double or Nothing against The Young Bucks. The women wrestlers include the likes of Britt Baker, Kylie Rae, Nyla Rose, Penelope Ford, and Brandi Rhodes. Brandi Rhodes who is also the Chief Branding Officer of AEW, was in conversation with Dave Millican, "The Ace of Belts." Dave is one of the premiere Championship belt makers in professional wrestling whose clients include WWE, TNA and now AEW. Brandi: How are things coming along with the title? Dave: Things are coming along great. I've been working on finalizing some layering aspects of the design and they're coming along nicely. Brandi: They have this fixation with this title being as large as the Mid-South North American. Is it that accurate? Will it be that large? Dave: Yeah. We're going for that ballpark. Here's what the Mid-South North American Title looked like. That's a big freaking belt! Kenny Omega and Chris Jericho will (probably) be headlining AEW Double or Nothing on May 25 at the MGM Grand Arena in Paradise, Nevada. Will the AEW Championship be revealed at Double or Nothing? Comment below!